Who was responsible for the most heinous crime in history, the crucifixion of Jesus Christ? The Jews? The temple priests, jealous of his popularity? Pontius Pilate, Roman governor of Judea, fearing Jesus’ claim that he was a king? Crucified Under Pontius Pilate seeks an answer. 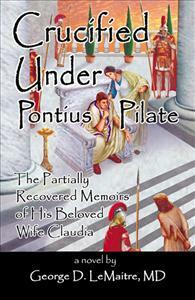 Pilate’s story, as recounted in the memoirs of his beloved wife, Claudia Procula, is one of guilt and responsibility. It is the story of a cold war between two Empires, of a nation dominated by Rome, of two people married fifty years. Pilatus and Claudia are “everyman and every woman.” Their lives, their trials, their hopes have been repeated down through the centuries. I have read Dr. LeMaitre’s manuscript. I am neither a literary critic nor a professional historian, so I am in no position to appraise its prospects of publication, or its full factual accuracy on all details. But I did find it an amazing and most enriching work. The author, obviously, is a man of vast classical learning who has researched the place and period profoundly. He does succeed in bringing to life some very unique personalities and environments. One might quibble about some very minor details, yet his overall command of that segment of Jewish, Roman and Greek realities is truly breathtaking. And I was moved by his splendidly open-minded and empathetic approach to a most controversial subject. Quite clearly, his perspective is a Christian one (though at times a bit unorthodox). But his ability to recreate Jewish attitudes, feelings, fears, loyalties is indeed admirable. There is a generosity of spirit in evidence on every page ---- and I am touched by it, and very thankful for it. I do sincerely hope that the work will gain the recognition it so richly deserves. Again I salute the author. . . .